The moment when the disinformation campaign around the Azov Sea started was not when Russia seized three Ukrainian vessels and their crews after opening fire at them on November 25, like reported by euvsdisinfo.eu. In fact the campaign had been launched much earlier. More than a year ago, Russian media started publishing claims of “Ukraine deepening the seabed for a NATO fleet at the Azov Sea”. In fact no evidence to any such “NATO fleet” can be found. During the last summer and autumn the disinformation campaign intensified. We heard that Ukraine had suddenly “infected the Azov Sea with cholera” (the World Health Organisation reported that they have no data of any cholera cases there). 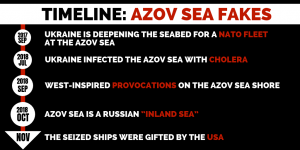 In September the messaging was already preparing the ground for later disinformation, forecasting “West-inspired provocations on the Azov Sea shore” and that the US has been “planning for clashes between Ukrainian and Russian naval forces in the Black Sea since 1990s”. The “evidence” is based on a video game a former Russian soldier claims to have seen 15 years ago. All these disinformation messages have the same objective: to show that Ukraine is the aggressor and that it takes orders for its “provocations” from the West. 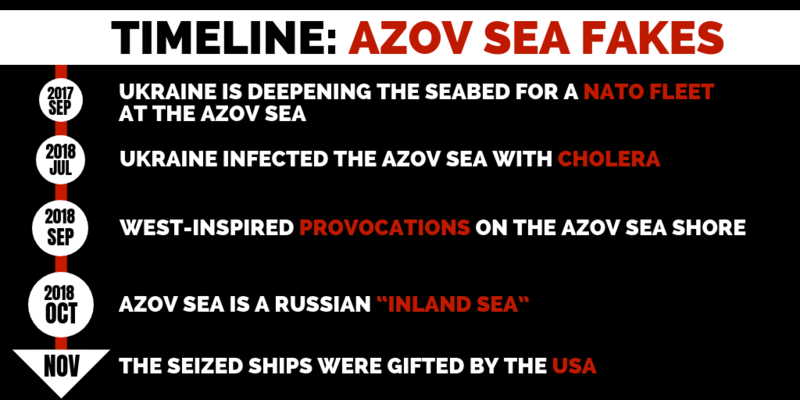 Always a convenient message for Russia’s disinformation; when we look at the illegal annexation of Crimea, or consecutive false claims that the Azov Sea is a Russian “inland sea” – or Russia’s celebration of the use of military force against Ukraine. The English-language conspiracy sphere invented one more theory to justify Russia’s actions. The impeccable logic goes that Russian special forces actually managed to stop a provocation that might have led to World War III – as UK and Ukraine secret services were apparently transporting a portable nuclear device to explode the Crimea bridge. No efforts were made by the authors to even try and offer some proof.